Can you imagine making one trip to the grocery store and arriving home with enough ingredients to create 70 delicious meals? Kelly Donlea introduces us to an incredible cooking plan in her 70 Meals, One Trip to the Store cookbook. In this 64-page cookbook she gives us the strategies on how this cooking plan works – both semi-annual and weekly shopping lists, 70 recipes to create for your family along with a few dinner time organizing tips for you as a the MOM Chef. This week’s Let’s Make a Meal Monday’s recipe is one of the 70 delicious recipes from Kelly Donlea’s cookbook 70 Meals, One Trip to the Store. Cook chicken in 1 tablespoon oil over medium heat, stirring frequently until cooked through. Let cool. In small bowl, whisk together egg, oil, salt, pepper, garlic, Parmesan cheese and lemon juice. Add chicken to dressing mixture and toss to coat. Spoon ¼ of the mixture onto each of the 4 tortillas, and add equal amounts of lettuce. Roll to form wraps. 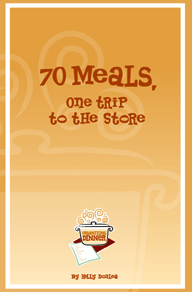 WIN – Enter to win this week’s featured cookbook by Kelly Donlea – 70 Meals, One Trip to the Store. Oh, I would love to win a copy of this book. 70 meals from one trip? Sounds like heaven. My fave cookbook is actually a cooking magazine…Simple and Delicious. I have every issue! Yummy recipe…. love those chickes wraps, hope they are good for health also. With gas prices as high as they are…one trip to the store and able to fix 70 recipes sounds great! I’m still liking Quick Cooking 2002 (the compilation of that year’s recipes from the magazine). The Busy Woman’s Slow Cooker Cookbook also has a lot of great recipes. I love the good and easy cookbook by betty crocker but I also love any church cookbooks, they are always full of great tried and true recipes. I would love to win this cookbook, sounds like it would be a new favorite and a lifesaver. I’m a big fan of Ted Allen and his book, “The Food You Want to Eat” is great. The recipes are wonderful (crabcakes, yum!) and there’s a ton of useful tips on everything from entertaining to selecting ingredients.